Ultraviolet radiation breaks down the skin's connective tissue — collagen and elastin fibers — which lie in the deeper layer of skin (dermis). Without the supportive connective tissue, the skin loses its strength and flexibility. 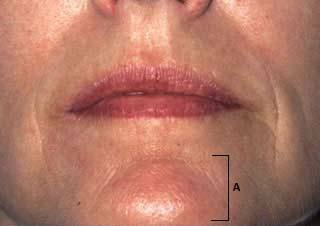 This condition, known as solar elastosis, is characterized by vertical creases (A), deep wrinkles, and loose or sagging skin. Use an exfoliating cream to exfoliate your skin. The process of exfoliation involves eliminating the dead skin cells from the surface layer of your skin. It also stimulates the production of new elastin and collagen and gives your skin a more youthful appearance. Take a vitamin C (ascorbic acid) supplement every day, recommends Dr. Fredric Brendt, author of "Age-less: The Definitive Guide to Botox, Collagen, Lasers, Peels and Other Solutions for Flawless Skin." This vitamin is vital in elastin and collagen production. A deficiency in ascorbic acid can weaken elastin fibers. The recommended dosage for vitamin C is one 500 mg capsule once daily to help maintain the cellular structures which keep the fibers of your complexion strong and healthy. In addition, eat foods rich in vitamin C, such as broccoli, kiwi fruit, bell peppers and citrus fruits. Add one or two servings of healthy protein to your diet every day to help stimulate collagen and elastin production. Your muscle mass as well as the collagen and elastin in your skin are composed of proteins. Healthy foods rich in proteins include tofu, nuts, seeds, milk and cottage cheese. Apply sunscreen lotion generously to your skin when doing the aforementioned methods to help prevent further damage to the cells in your skin. Sunscreen can help protect your skin from the sun's harmful ultraviolet rays which can break down collagen and elastin. Purchase sunscreen with a sun protection factor (SPF) of 15 and above and massage it into your skin 30 minutes before going outside. Moderately priced as well as scientifically formulated, they offer products with collagen, elastin, antioxidants and vitamins. 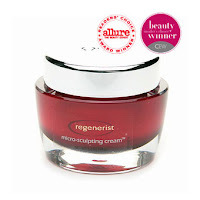 Its Regenerist Micro-Sculpting cream may firm the appearance of skin in sagging-prone places, such as the jawline and neck. Packed with green tea extracts, collagen, elastin and vitamins B3, B5 and E, this product can be applied day or night to help firm and smooth your skin. St. Ives offers a moisturizer that contains collagen elastin proteins, which the company claims can visibly reduce wrinkles on your skin. Designed to be used for day and night, this noncomedogenic, dermatologist-tested product is also recommended for oily and combination skin types. The formula is made without parabens or pthalates, and the company never tests its products on animals. 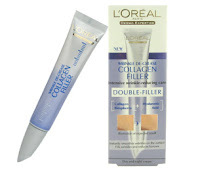 L'Oreal offers an entire line of products with collagen, from a Micro-Pulse eye roller to a collagen filler lip cream. Its eye roller provides collagen and Erasyl, which the company claims can help target crow's feet around your eyes. The roller technology can purportedly pulse away puffiness and dark under-eye circles. The lip cream is designed to tackle the vertical lines that form around the mouth. Other products in the collagen filler line include Targeted Wrinkle Reducer, Moisture Filler Day/Night cream, day lotion and an eye cream without the pulse technology. 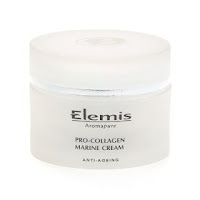 Elemis is a spa-quality product line that offers nine different Pro-Collagen products that are marketed to improve the tone and elasticity of your skin. The Pro-Collagen Marine Cream uses marine extract Padina Pavonica to smooth out wrinkles. The Lifting Neck and Bust treatment is supposed to help lift sagging skin. The company states that in an independent, clinical trial, this product reduced slackening skin by up to 33 percent and increasing firmness and elasticity. The company also makes a Pro-Collagen Quartz Mask, which contains quartz, Padina Pavonica, Noni, Moringa and Argan Tree Oil as well as a Pro-Collagen night cream, eye renewal cream and a Wrinkle-Smooth pen.